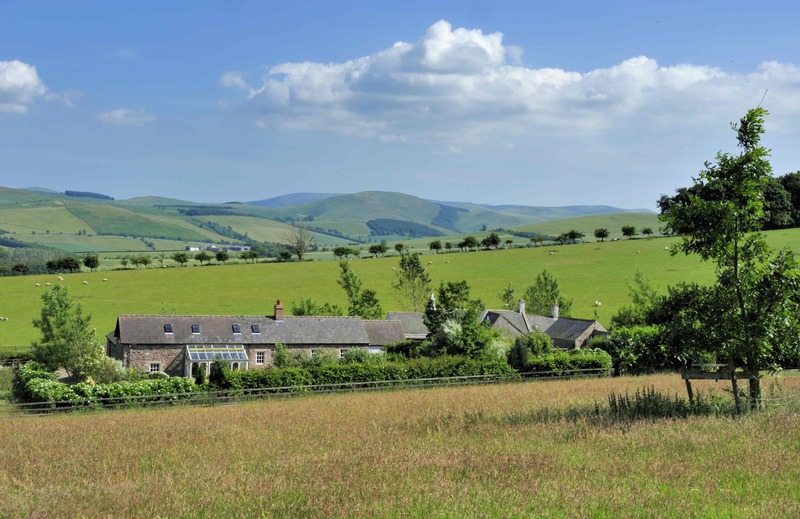 Fernie is situated in the middle of the estate with stunning views of the Cheviot Hills and will soon be available to rent. It is a 6 bedroomed family house, combining the original shepherd’s cottage and converted sheep steading. It is surrounded by three separate garden areas leading into each other: a sunny south facing courtyard garden, a walled garden and also a big flat lawn surrounded by paddocks. The living areas are perfect for entertaining, open plan with the original beams exposed. There is also accommodation and grazing available, by prior arrangement, for horses and ponies, so that you can bring your 4 legged team as well! Large farmhouse kitchen with stunning views of the hills and double French doors leading out to the south facing courtyard garden. The kitchen contains a 4 oven aga, 2 gas hobs and a double electric cooker, a full size fridge, kitchen island and a breakfast table seating 6-8 people. Leading off from the kitchen is a large larder. Guests have a choice of relaxing in the drawing room with a large open fire and built in drinks cabinet complete with fridge, or the sitting room / mezzanine accessed by stairs, both lead off the kitchen offering comfortable seating and extensive views of the farm. Below the mezzanine and leading off the kitchen is a spacious dining room seating 12-14 people comfortably. There are 5 principal bedrooms and an additional children’s bedroom: Bedroom 1 with two 3’ beds and shared ensuite bathroom with Bedroom 2 with 5’ bed, Bedroom 3 with two 3’ beds and built in wardrobes, Bedroom 4 with 4’6” bed. Along the corridor there is an additional shower room and a family bathroom. The Master bedroom has an ensuite bathroom with both a shower and bath, a walk-in wardrobe. Bedroom 6 has a 3’ bunk bed and access to the bathroom is via the master bedroom. The entrance hall has a downstairs loo and separate cupboard for hanging coats. Extensive back kitchens running parallel to Bedrooms 1-4 provide ample storage space for outdoor kit, including a drying room. In the garden, there is a secure dog run available for use, as well as various outbuildings for storage of bikes etc. Fernie is in a secluded position accessed by a mile long farm track (during winter months care should be taken), with a large sheltered garden and a woodland walk with pony paddocks and stabling available. Any passing traffic is usually only that associated with a working farm – mainly sheep as they are moved round the farm. If you would like to book Fernie, please follow this link to find availability and prices and to make a booking.